Ah, such a sweet estate, with every appurtenance—out in the country, yet convenient to the nearby Khajiiti metropolis of Dune! What can one do but love and admire it? 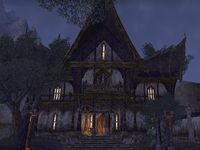 Dawnshadow is a large player house in eastern Reaper's March.